A place for me to share my love affair with tillandsias (aka ‘air plants’). I first found out about these plants more than 20 years ago but have only recently restarted this hobby (recently being January 2012). I hope you enjoy the pictures, and remember the information I share is based on growing in my location, which is Kuala Lumpur, Malaysia. I share your love affair with this tillies. I only discovered them 6 weeks ago and I am head over heels in love with them, in Phoenix, Arizona, US. Thanks for dropping by. Now that you have started it is a long and slippery slope! 🙂 But definitely a fun hobby to indulge in. At least in the US you should have easy access to a wide range of species and hybrids. Happy growing! I ran into them at a street fair. I ordered more online (I only have 22 so far) but there is a terrific nursery in California I am dying to go to! It will be like Nirvana! Love your blog! Thank you so much for sharing. I was married in the epiphyte house of the bontanical gardens here in Buffalo, NY USA about 5 months ago. 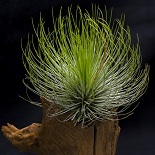 I fell in love with tillandsia while researching epiphytes on line and ordered 5 different species about 3 weeks ago. I’m trying my hand at raising these beauties in this less than ideal climate. My caput-medusae had already developed a green spike when I received it (though much smaller than yours appeared during bloom). It’s blushing beautifully and I can’t wait to see flowers. Wow, there is an epiphyte house? Now I want to go to Buffalo. I have never been, and live in Phoenix. I would SO love to see pictures of your wedding to see what they did with them. I have 22 so far, and I adore the blooms and I really love taking care of them. We moved (yesterday!) into a new house with so much light and a lot of ceiling fans and I know they will love it here 🙂 I have some of them hanging in necklaces in the window, some hanging on strings from the plantation shutters, and some tucked into the kitchen blinds, and it looks like one of those tillandsia walls. I loved reading your post! Your home sounds beautiful. Garlands of tillies!! I’m in a small apartment, but I have an attic storage area that functions like a green house. It gets brutally hot, above 100 degrees in the summer, but I get a wonderful cross breeze. My arids and tropicals seem to thrive. My medusae has a purple bud emerging as of yesterday. Yay! Approximately how long does the blooming process take in medusae? Thanks for the temperature tip. We’ve had a mild summer so far, so the temp hasn’t gone above 90. Still have July and August yet though. I’ll move the tills into my cooler living space as temp rises. Hi Robyn and Heather Jane! And yes HJ the epiphyte house sounds like a lovely place for a wedding! I have finally updated my blog with a couple of posts after neglecting it for a while. Hope you will continue to check in every so often. Hi Minigemm, I discovered the wonderful world of tillandsias just 2 weeks ago and I’m a close neighbour down to the south in Singapore! 🙂 I got 8 little ones last weekend and am hoping that they will do OK. 😀 Thanks for sharing so much info on your blog! Hey, I have a Tillandsia that looks like a Caput Meduase, however when it flowered, it did not produce a spire (like my other Caput Medusae) and it only produced one flower. Any idea as to what it’s scientific name is? Without a picture I can’t even try to hazard a guess as to what the plant may be. It could very well still be a caput, sometimes something goes wrong with the flowering process and you get sort of a mini bloom or stunted flowers. This is mainly caused by a shock to the plant, perhaps a change in the growing environment causing the flowering process to be aborted early. I wouldn’t worry too much. As long as you have the growing conditions right the plant should pup and you will be able to enjoy a blooming plant a few months down the line (yes caputs are fast growers and happy bloomers).